The roughly two dozen suites that Bach composed for keyboard instruments were written for private use of his students, and are predominantly French in style. The present French suites, which remained unpublished until long after his death, were composed after Bach’s arrival to Cöthen, and the full collection was only completed by 1725, once he had moved to Leipzig. In the process, Bach repeatedly revised the French suites, shuffling certain works into and out of the set and altering a number of movements quite drastically. In the French suites Bach decided to say more with less, avoiding obvious virtuosity in favor of sublety and refinement, coming closer to what French composers like Couperin, whose music Bach knew well, called le bon gout. “I had never previously felt such a natural flow as in the hands of this your performer… The absolute reference for these works”. 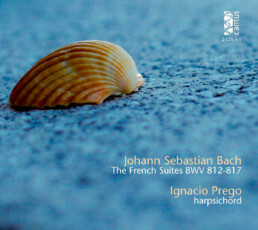 “…with irrepressible vigor and elegance… Mr. Prego provides an exhibition of dizzying virtuosity allied with compelling emotional directness…” “…Young Spanish harpsichordist Ignacio Prego proves himself to be not only a gifted musician but also a galvanizingly prescient interpreter of the music of Bach. “. “Ignacio Prego reminds listeners—and, hopefully, fellow musicians, as well—that Bach’s music does not require proselytizing. Excellent music excellently played needs no pedagogical justification”. “Ignacio Prego is gifted with a musical verbe of undisputable quality. His expressivity, as is widely apparent in this recording, is truly exquisite”. “Ignacio Prego performs this 2 Cd set with great subtlety and refinement. It is an exquite production”.